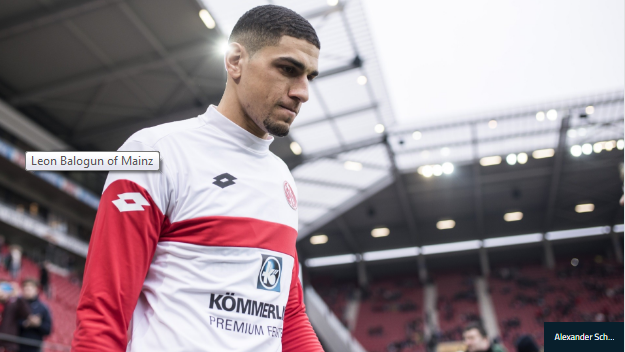 Super Eagles of Nigeria defender and Mainz 05 of Germany defensive stalwart Leon Balogun was in splendid form on Monday night. He started for Mainz 05 in a Bundesliga match against fellow strugglers Freiburg at the Opel Arena. Mainz 05 has struggled terribly this season and were in the 16th position before the match, they have played six league matches in the last two months without recording a win. Mainz 05 last victory was on the 16th of February away to Hertha Berlin. Mainz 05 came into the match knowing that a win will take them above their opponent on goal difference and also out of the relegation zone. It was a must-win match for Leon Balogun and teammates if they are to salvage their season. Mainz 05 who have found scoring goals hard to come by this season, took the lead in the 45th minute through Pablo De Blasis and the score remained 1-0 in favour of the host as they went into the half-time break. On resumption of the second period, Freiburg tried to get an equaliser but Mainz 05 defence marshalled by Leon Balogun stood firm and resilient dwarfing all the offensive forays of the away team. Balogun was cautioned in the 75th minute. Pablo De Blasis scored again in the 79th to put the game beyond Freiburg and hand Mainz 05 their first Bundesliga victory in two months. Pablo De Blasis was replaced by Nigerian striker Anthony Ujah in the 90th minute. Leon Balogun has made 14 Bundesliga appearances this season, playing a total of 1176 minutes and cautioned four times. The defender is yet to register a league goal for Mainz 05 this season.